Nowadays, being forty-one years of age marks the middle of one’s life. It can be a time for reflection on what we have achieved and what we want to do in the remaining future. It can also be a time for denial, when the past is consumed as mere nostalgia and the present momentum of life is adhered to with the gritting of teeth. This was the dilemma of the nation in August 2006. The National Day celebrations were getting perfunctory; the Parade was given significance only by the fact that it would be the last one held in the old National Stadium before it is torn down for redevelopment into a cosmopolitan sports hub that would complement the ‘bustling global business and financial hub’ in adjacent Marina Bay (Singapore Sports Council, Sports Hub marketing brochure, c. 2005). Even more so in the age of globalization, relentless national progress does not have the time for the grounding of memories and identity. Amidst the weary celebrations, cultural producers struggled to organize reflections on our national identity. Theater company Wild Rice staged the Singapore Theater Festival for a good part of August. Among the plays was Paul Rae’s National Language Class, a provocative piece inspired by Chua Mia Tee’s 1959 painting of the same title. Journalist Ong Soh Chin wrote a thought-provoking review of the play National Language Class (Straits Times, 19 August 2006, p. S10). For Ong, the interplay of Malay and Chinese languages and racial personas in the play produces poignant questions of national identity in a multicultural society confronting cosmopolitanism and globalization. The questions scribbled on the chalkboard in the play-painting, ‘siapa nama kamu?’ (what is your name?) and ‘di-mana awak tinggal?’ (where do you live? ), are questions that need to be asked of Singaporeans today. Figure 1. Chua Mia Tee, National Language Class, 1959, 112 x 153 cm, oil on canvas. Source: Kwok 1996, p. 71. I have not seen the play. Nor have I reflected at length on the painting, which I have seen at the Singapore Art Museum. But today, the painting and the questions bothered me. Siapa nama kamu? Di-mana awak tinggal? The chalk scrawls in the margins of Chua’s painting called out to my social existence and very location in the cultural and political muck of postcolonial Singapore and demanded a response. Being homo historicus, I peered into the painting to see the depth of time and the mark of the author. Perhaps then, I would have an epiphany on the location of my name. Chua was born in China in 1931 and migrated to Singapore in 1937, growing up along the banks of the Singapore River. He might have arrived in time to watch the lavish celebrations of the coronation of King George VI in May, where all the ethnic communities of Singapore held parades and other festivities to show their loyalty to the Empire, a nascent exercise of Frankensteinian multiracialism (based on the notion of distinct separate parts joined into one) in service of a communal spectacle not unlike our National Day Parade. But 1937 was also the year that organized anti-colonial political action against the British began. In late 1937, in two separate incidents, 10,000 Chinese rubber and coal workers went on a communist-organized strike and 13,000 Indian municipal and construction workers went on a nationalist-inspired strike. The strikes, which would be followed in later years by more industrial action, made mockery of King George’s loyal multiracialism, exposing the ethnic fixing of colonial exploitation and heralding the anti-colonial movements that would span rural and urban Malaya and Malayans of all racial hues after the War. It is in this context that we should place Chua’s painting. There is some confusion over which year it was painted, 1950 or 1959. Kwok Kian Chow’s Channels and Confluences: A History of Singapore Art (1996, p. 71) put the date down as 1950. Ong dated it as 1959, thus giving the work the interpretation of ‘a patriotic post-colonial assertion of national identity’. 1959 has to be the correct date, since Malay was not promoted as Singapore’s national language until the late-1950s. The exact date is not as important as the implications of the decade signified by 1950-59: from the height of the Emergency sparked by the communist revolt in the peninsula after the failure of the Malayan Union proposal to grant equal recognition to all races, to the year of Singapore’s attainment of self-governing autonomy, through the turbulent years of anti-colonial action organized by socialists in Singapore. After the failure of the communist revolt, the socialists outside the ambit of the Malayan Communist Party in Malaysia and Singapore sought to form loose alliances. This was a multiracial compact, involving leaders like Said Zahari, MK Rajakumar and Lim Chin Siong, one of the founders of the People’s Action Party (PAP), formed to reassert the Malayan Union multiracialism. Their ‘Malaysian Malaysia’ cry was later championed by Lee Kuan Yew and the ‘democratic socialist’ PAP purged of radical socialists, including Lim. Lim was influential in advocating for Malay to be adopted as the national language and learnt by everyone wishing to call him/herself Malaysian (see Tan and Jomo 2001). Chua’s artistic style has been called Social Realism, a school of art responding to the industrial revolution and urbanization, focusing specifically on working class realities rather than the colored idealism and ‘bourgeois’ formalism of Impressionism. Many social realist artists around the world were socialists but not necessarily communists. In Singapore, the social realist artists were associated with the Chinese Middle School Arts Association, the Equator Art Society and the Woodcut Movement. The Singaporean social realists blended anti-colonial sentiment, nationalist aspirations and socialist concerns in various proportions in their work. In their 1965 catalogue, the Equator Art Society artists criticized contemporary artists for copying Western art, “which has not the least of our national flavour”, which is “not the art that serves to help uphold our national dignity and to help in our nation building” (quoted in Kwok 1996, p. 72). If we look closer at the painting, the trace of Lim Chin Siong’s socialist promotion of Malaysian multiracialism through linguistic adoption is evident. Pasar Melayu (market Malay), after all, was already well used by the common people. Malay would not only bring together all the races but was also the language of the working classes, the socialist common denominator of class equality. 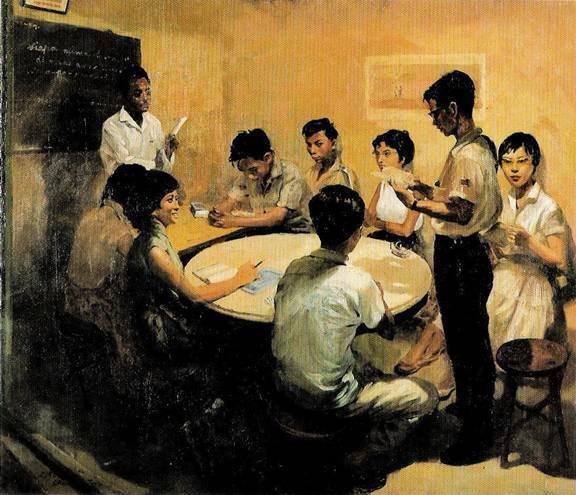 Significantly, Chua’s painting shows young women and men, the future of the nation, of different linguistic habits and different classes learning Malay from the cikgu: the bespectacled middle-class man of pressed pants and shoes, the working-class man in white cotton shirt tucked out of khaki slacks in loafers, the woman in white Chinese school uniform dress, the smiling nonya woman in capped-sleeve baju Shanghai and so on. Notice that they sit around a round table, a symbol of equality, which also signifies a plebian/proletarian public sphere, being reminiscent of the marble-top kopitiam tables one find in the coffee shops of old. As they sat facing each other, they are called to consider the deceivingly simple questions: Siapa nama kamu? Di-mana awak tinggal? But that was 1959, when the belief that unity in the quest for national progress would eradicate the divisions of race, class and gender was at its peak. The subsequent trauma of racial conflict inflicted by membership in the Federation of Malaysia and separation from that fraternity led to the PAP government’s adoption of strong political discipline to accomplish rapid economic development. It was more the rule of the rattan cane rather than the iron-rule of an authoritarian dictatorship, but slowly, the democratic socialism of the PAP rulers morphed into communitarian capitalism (see Chua 1995). The class struggle was submerged under the weight of the heightened management of multiracialism, ideologically successful provision of housing and labor welfare and knee-jerk responses to any form of dissent remotely related to class politics. In the paternal and censorious atmosphere, the knuckles of cultural producers who openly reflected on our national identity, asking ‘Siapa nama kamu? Di-mana awak tinggal?’ in the crosscutting terms of race, class, gender and sexuality, were rapped. The more recalcitrant voices, including playwright Kuo Pao Kun, were grounded, detained without trial, for years. Figure 2. 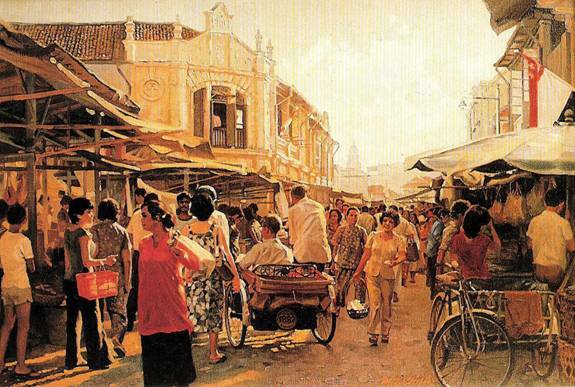 Chua Mia Tee, Market Place at Clive Street, 1982, 91 x 61 cm, oil on canvas. Source: Chua 1986, p. 26. Chua’s social realism shifted its focus and became less politically charged. But class remained an important topic for Chua. As the fabric of vernacular everyday life disappeared with the spatial cleansing of the state’s urban renewal programs, Chua ‘saw the urgency as an artist to document those scenes which I knew would disappear soon from Singapore’s cityscape’, from Chinatown to the various marketplaces that dotted the downtown area, to ‘the daily bustle of the barges, the boatmen and the coolies, against a background of old shophouses and godowns’ of the Singapore River. In Market Place at Clive Street (1982), we find the vernacular texture of multiracial Singapore, where different economic classes of Singaporeans in their culturally and colorfully diverse outfits mingle and interact for the provision of everyday life. Such scenes of vernacular multiracialism are now impossible to find in clean and green Singapore. The conserved shophouses and godowns of the Singapore River, splashed with the psychedelic and neon colors of lifestyle consumption, are now celebrated as cosmopolitan watering holes of the young and the well-heeled, where socially mobile locals flirt with global corporate elites. In this historical erasure, it is easy to slip into remorseful or consumptive nostalgia with Chua’s images of depoliticized realism. Critical reflection requires a different form in this day and age when the consumption of images, memories and nostalgia is accelerating with the cultural flows of globalizing mass media. The critical work of art in the age of electronic reproduction is a form shorn of nostalgic images, pared down to the bare minimum of abstract concepts represented by familiar objects. Cheo Chai-Hiang’s Singapore River (2006) interrogates the transformation of the River, which Chua memorializes as ‘the lifeblood of Singapore’s economy’ (quoted in Lim 1990, p. 32), from this object-conceptual perspective. The piece began life as a rejected submission to the 1972 annual exhibition of the Modern Art Society consisting of instructions to the exhibitors to draw a five-feet square partially on a wall and partially on the floor (see Sabapathy and Briggs 2000). 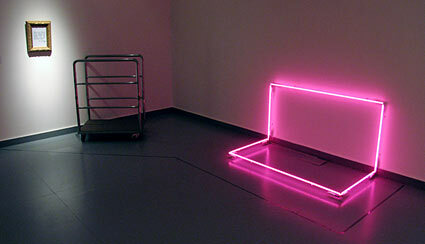 In the 2006 piece for the Singapore Biennale, which began in September after the National Day celebrations and coincided with the heavily guarded conferences of the International Monetary Fund and World Bank summit, the square was made up by neon lighting tubes and accompanied by a hotel luggage trolley. Reference to the framed River paintings of nostalgic consumption and remorse is made in the ornately framed text, where Cheo writes, ‘There are at least 40 Singapore River paintings in the Singapore Art Museum Collection alone. Hundreds of other such paintings have been produced and consumed … some simply forgotten’. The object-art provokes desires that give pause for a critical reflection and calls for a response. Should one take the trolley for a joyride on the circuits of globalization to the heart’s content? Should one smash the fragile glass in protest against the new imperialism that shackles us with delightful consumerism? What and who have been forgotten in the transformation of Singapore into a cosmopolitan global city? Figure 3. Cheo Chai-Hiang, Singapore River, 2006, installation. Source: Gerhard Haupt and Pat Binder (eds. ), “Singapore Biennale 2006”, Universes in Universe – Worlds of Art, http://www.universes-in-universe.de/car/singapore/eng/2006/index.htm, downloaded 11 Feb. 2007. I read the resurgent significance of Chua’s National Language Class as aligned with Cheo’s critical gesture towards Singapore’s participation in globalization. I interpret National Language Class with the same abstract conceptualism that marks Cheo’s Singapore River. I see not a painting evoking an idealism of a bygone era, to be appreciated in light of today’s realism, but objects with race and class vectors – cikgu, young men and women, round kopitiam table – strategically lined up by Chua like Cheo’s neon-lit square and mobile trolley, accompanied by the blackboard-framed text that calls for a critical response. Siapa nama kamu? Di-mana awak tinggal? Here is where I locate my critique of Ong’s review of the play and the painting, for the dimension of class is missing in her attempt to draw out the race-language-nation connection. Race-class-language lies at the heart of today’s divide in globalizing Singapore: pre- and post-65ers, heartlanders and cosmopolitans. The physical and social mobility of the educated elites is being matched by the physical and social stasis of increasing number of citizens of the middle and working classes. The influx of lighter-skinned foreign talent to be considered as our immigrant brethren is being matched by the flux of darker-skinned foreign laborers whose desire to be citizens are irrelevant just as our forefathers’ desire once were under British rule. The significance of National Language Class is not linguistic, not the psychological dissonance we get when we sing the National Anthem in Malay just before reciting the pledge in English. The significance is in the issues of race and class, inflected through language, tearing at our official multiracial identity in the age of globalization. We are in dire need of a multiculturalism that is bottom-up democratic, that instead of happily glossing over the old-new inequalities with consumption and nostalgia would push them to the forefront of public consideration. Who are you? Where are you? Chua Beng Huat, 1995, Communitarian Ideology and Democracy in Singapore, London: Routledge. Chua Mia Tee, 1986, Chua Mia Tee, Singapore: Chua Mia Tee. Kwok Kian Chow, 1996, Channels and Confluences: A History of Singapore Art, Singapore: Singapore Art Museum. Lim, Richard (ed. ), 1990, Singapore Artists Speak, Singapore: C. H. Yeo. Sabapathy, T. K., and Cecily Briggs, 2000, Cheo Chai-Hiang: Thoughts and Processes (Rethinking The Singapore River), Singapore: Nanyang Academy of Fine Arts and Singapore Art Museum. Tan Jing Quee and Jomo K. S. (eds. ), 2001, Comet in Our Sky: Lim Chin Siong in History, Kuala Lumpur: INSAN. With regards to bottom-up democratic multiculturalism, I recently watched (on YouTube) a Channel 8 documentary on Little India where they featured two Nigerians who own a coffeeshop stall and married Singapore women. If you look at Alexa, the top websites visited by Singaporeans throws up some surprises – Korean sites, cricket sites etc. Our mindset of multiculturalism seem stuck at the 70% Chinese, 20% Malay, 7% Indian 3% Eurasian demographics which do not hold true anymore. On the other hand, we have this obsession with saying we’re uniquely multicultural and harmonious. There aren’t many countries/societies that remain homogeneous in our world today. In fact there are many more countries/regions/societies which are handling racial/cultural diversity in a more rigorous way than we are. By the way, great article and overall, great project! I am “confused” that the caption for the painting “National Language Class” by Chua Mia Tee, is dated as 1960, in Straits Times’ report on the exhibition “Singapore 1960” opened recently at the Singapore National Museum (SNM). Apparently Singapore Art Museum has already updated the date to 1959 in their last few displays of that paintings since 2004. How come the painting can be dated as 1960 for this show at SNM now? Or it is a mistake by the ST journalist?? Mistakes do happen in art history. The problem then is that it gets perpetuated if unchecked. A catalogue of Choo Keng Kwang’s works described his ‘513’ woodcut as referring to the May 13 racial riots of 1969 in KL. But Choo was depicting the May 13 clash of 1954 between students and the police over the issue of National Service. What one can do is to go back to the source, double check the facts and talk to the artists, if possible. And do erratas. Yes, I also remembered seeing that “big” Choo Keng Kwang book at the “IMPORTANT SECOND-GENERATION ARTISTS SERIES (5) ” exhibition at an art gallery at Holland Village in 2006, and I was quite shocked that the woodcut by Choo, dated 1954 could be described as the event that happened in 1969! Incidentally, another “second generation artist” the late Ng Eng Teng did create a sculpture based on the racial riots “May 13, 1969 incident” in Malaysia. Not sure if NUS Museums has the work? Maybe Ng Eng Teng was referring to the racial riots “May 13, 1969 Incident” in Singapore? Where to see his work? Got catalogue or book? “Masterpieces from Private Collections” / presented by the Ministry of Community Development and the National Museum, as part of Singapore Festival of Arts 1988. Thanks for the clarification that the painting “National Language Class” (上国语课) was indeed dated 1959. These portraits interpret the life style of the people from different periods but this might not be the actual scenarios.